Your membership must be current and in good standing. A Single Membership* to the ISSDC valid for one year** may be purchased by Breeder Members as a gift to their new puppy buyers. 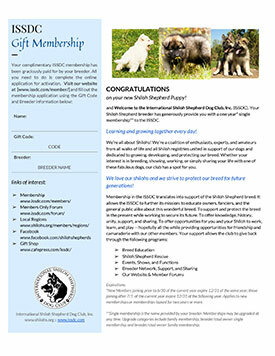 The Gift Membership Certificates are emailed to the Breeder to include in their puppy packets; each certificate contains a unique gift code for puppy buyers to use on the ISSDC application. Current Breeder/Stud Members in good standing for puppy buyers of current litters. Offered to introduce new puppy buyers to benefits of the ISSDC for the discounted price of $7.00 per Gift Membership. Breeder/Stud Members confirm current litter information and purchase Gift Memberships using the form below. Upon purchase, you will be emailed Gift Membership Certificates with codes for Gift Memberships to distribute to your puppy owners. As all new members are required to submit an application per ISSDC bylaws, puppy owners receiving a Gift Membership must also complete the application, selecting “Gift Membership” as type and entering their unique gift code on the payment screen of the application. Gift codes are non-refundable and expire 7 months after date of purchase. * One Year Membership – New Members joining prior to 6/30 of the current year expire 12/31 of the same year; those joining after 7/1 of the current year expire 12/31 of the following year. Applies to new membership or memberships which have lapsed for two years or more. ** Single Membership – is the classification offered with this Puppy Gift Membership. Membership may be upgraded at any time to either family membership, breeder/stud single membership or breeder/stud family membership. I acknowledge that I have read and understand the terms of this special membership. Instructions Upon submission of this form, you will be directed to our payment page. Your request is not complete until payment is made.